Smartphones are fast becoming a viable alternative to PDAs and laptops, offering phone features such as voice and SMS coupled with mobile internet applications, multimedia functionality, high speed data processing capabilities, and inbuilt GPS capabilities. The total global mobile phone and smartphone market is expected to be worth $341.4 billion by 2015 while smartphone revenue will account for 75.8% of the overall mobile handset revenue at $258.9 billion in the same year. Smartphones are currently witnessing high growth due to a host of factors, including lower product cost, improved handset design and functionalities, the expansion of global mobile email and browsing services, the emergence of 3G and 4G network technologies, the rising competition among mobile carriers, and the standardization and upgrades of operating systems. The competition in the smartphone market place is at the peak and vendors are finding it difficult to maintain their market shares. Market leader Nokia has lost considerable market share over the past two years; to a market share of 32.8% in Q3’10 from 42.6% in the same quarter two years ago. Apple, on the other hand, gained 211% market share in Q3’09 over Q3’08 and then lost approximately 15% market share in same quarter in 2010 under the growing popularity of Android operating system and more number of devices switching to it. HTC and Samsung joined the Android popularity wave and are now the clear beneficiaries. 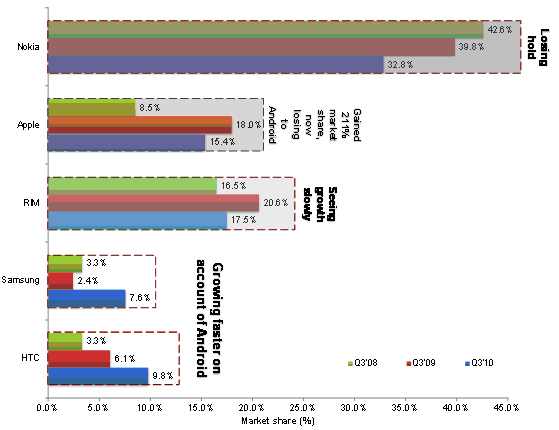 Samsung gained 316% market share in Q3’10 over Q3’09 while HTC gained 160% market share during the same period. The global market for smartphones operating systems (OS) is dominated by Europe with a 37% market share. Asia-Pacific follows with a share of 31%, accounted for mainly by Japan, Korea, China, and India. Symbian is the most popular mobile OS in Europe and Asia, while Blackberry OS dominates the North American OS market. IPhones mobile OS has shown a high growth rate in the North American market in last two years, and is expected to have a double-digit growth rate in next few years as well. This report will identify the key players in each application market; focusing on their growth strategies and other developments such as geographic expansion and the development of patented technologies. The report extensively analyzes each macro and micro smartphones market based on operating system; and offers market analyses of application segments such as consumer and business smartphones. In addition to market sizes and forecasts, the report also provides a detailed analysis of the market trends and factors influencing market growth, offering in-depth geographic analyses of the smartphones markets in the North America, Europe, Asia-Pacific, and Rest of the World (ROW). The report draws the competitive landscape of the global smartphones market, providing an in-depth comparative analysis of the technical and marketing strategies the key players are adopting in order to gain an edge over the their competitors. The total global mobile phone and smartphone market is expected to be worth $341.4 billion by 2015 while smartphone revenue will account for 75.8% of the overall mobile handset revenue at $258.9 billion in the same year. Mobile phones with basic functionalities such as voice, SMS, camera, and video are often referred to as feature phones, whereas high-end mobile phones that offer more advanced computing ability, and provide one stop solution for information management, voice and video calls and web access are referred to as smartphones. In addition to being a communication device, modern mobile phones now have additional capabilities, such as SMS messages, internet access, gaming, Bluetooth, camera, MMS messaging, radio, and MP3 player, which helped in increasing the popularity and faster adoption of mobile handsets. The mobile handsets market has seen exponential growth since its first commercial launch in 1983. There were 12 million global mobile phone subscribers in 1990 and by the end of 2010; the number of mobile phone subscribers reached 5.2 billion. However, the growth has slowed a bit between 2006 and 2009 due to economic slowdown and lack of strong telecommunication infrastructure in emerging countries. The global smartphones market registered growth at a brisk pace, accounting for 22% of the global mobile handset sales in 2010. This high growth has been backed by rapid technology developments such as high-speed internet browsing, sophisticated personal and professional data management, and the evolution of 3G and 4G network technologies. The usability and the device class has helped the market to avoid the repeated feat of Q1’09 when market tumbled by 4% over Q4’08.